Capsuleer forces of the North and Imperial Legacy clashed last Wednesday in the system of X47L-Q in Pure Blind over the armor timer of a Keepstar citadel. The Keepstar, which had been reinforced a day earlier, is a major staging point for Northern efforts in the region against Imperial Legacy. 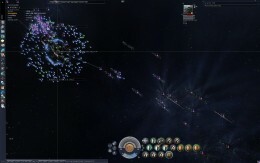 The battle was the largest capsuleer engagement since B-R5RB, involving 6,270 capsuleers and resulting in the destruction of the Keepstar's armor, bringing it to its final layer of defenses. A total of 738 Titans were fielded, along with 585 Supercarriers, 663 Dreadnoughts, 394 Force Auxiliary, 546 Carriers, and one Rorqual. Up to ten trillion ISK was destroyed during the battle, with Imperial Legacy losing the majority despite achieving their objective. The fight lasted over nine hours and saw the destruction of 58 Titans, 23 Supercarriers, 424 Dreadnoughts, 309 Force Auxiliary, and 21 Carriers, including two Vendetta-class Supercarriers and a Molok-class Titan, the first of its kind to ever be destroyed. Imperial Legacy utilized Supercarriers fitted with Heavy Warp Scramblers as highly damage resistant tackle by jumping them directly on top of the defending fleet and the Keepstar. This tactic proved to be effective, despite the danger inherent in the strategy, with a Northern Coalition fleet commander calling for faction Titans and Supers to dock to avoid losses. The Keepstar will become vulnerable again on Wednesday the 8th for its final timer. This battle has the potential to be considerably more destructive. If the defenders fail, their forces will be unable to safely tether and will be left vulnerable on the field. "Something about being perched on that edge makes me feel alive." With over 5,000 star systems and several dozen trillion inhabitants, the New Eden Cluster is rich with opportunities for cunning entrepreneurs to hunt for fame, notoriety, ancient relics or trade goods. For some capsuleers, the cluster may even give the impression of a sandbox on a playground, where the strong prey on the weak and the only rule is that there are no rules. The well-adjusted and proven process of cloning in combination with capsule technology makes a capsuleer quasi-immortal - and as such relieved from the existential fear of death and everything it entails. Many capsuleers make use of this new-found freedom by engaging each other in ship to ship combat, with no regard for the material value of a destroyed ship or that of its crew. GalNet and the bars on all stations in the cluster are bristling with accounts of nerve-wracking fights and the joy and satisfaction capsuleers derive from these violent encounters. To help new capsuleers and veterans alike understand the mindset of those who feel most alive engaging others in combat, we have attempted to answer some of the questions many have; Why do they do it? Do they suppress their human instincts for survival or do they embrace them? How did they start doing it? – And could just any capsuleer do what they do? To find an answer to these questions, this correspondent talked to the capsuleer Lasker Emanuel of Curatores Veritatis Alliance [CVA]. He is well known among capsuleers in parts of New Eden, especially around his base in the region of Providence. Lately, he became most famous for engaging gangs and fleets of capsuleers in dreadnought class ships - all by himself. Fighting against other capsuleers is a passion for him - pure bliss without any hate or despair. ISD Deloro (ISD): Hello, Lasker Emanuel and thank you for being available for this interview. Lasker Emanuel (L.E. ): Thank you for reaching out. I hope all is well with you. ISD: Could you first tell us a bit about yourself? What kind of activities and professions have you pursued in New Eden? L.E. : I became a capsuleer in YC113, following a friend of mine on that path. Although I had read a lot about capsuleer life, especially about capsuleer combat, which sounded fascinating, I had a hard time figuring out what to do as a capsuleer. In YC118, after a break, I decided to give the capsuleer adventures another try. I ended up taking an exploration frigate into Providence; I got blown up because I was KOS (red by last) and a Providence corporation recruited me. After coming out to Nullsec, things really got rolling for me. I started learning everything I could, and many fine folks inside and outside of CVA helped me out. I was interested in fleet, small gang and solo combat. In addition to the obvious activity of solo combat, I have also participated in plenty of fleet combat and some small gang engagements. I have also spent some time doing station trading, which is not a passion, but it helps fund my various adventures. ISD: When did you get into capsuleer vs. capsuleer combat and what part does it play in your everyday experience? L.E. : I have been fighting other capsuleers solo for about two years now, and I try to fight whenever I can. My various other duties keep me a little busy, but getting out and finding a fight is still my favorite thing in New Eden. ISD: Capsuleer vs capsuleer combat seems to be your passion. What is it about it that you enjoy? What drives you to look for these challenges? L.E. : Pretty much every hobby I have ever had has been some form of technically complex fight. The two I put the most time into before becoming a capsuleer were martial arts and chess. I love the dynamic where you are pitting yourself against another competitor and it requires preparation, creativity, study, practice, and an ability to think clearly under pressure. I have always deeply enjoyed situations where I am in danger but unharmed, and this is true in all sorts of games and fights, in the moments where a skilled opponent is attacking, or when they are trying to checkmate, throw, choke, or otherwise defeat you, and you are still able to contain, avoid, counterattack. Something about being perched on that edge makes me feel alive. There is another experience (a little hard to describe) that I absolutely love. Sometimes, someone plays or fights beautifully enough that everyone involved is no longer quite as worried about if they win or not, and they’re just kind of glad to be there experiencing the ephemeral little work of art that is being created. You could call it a ‘Fight-As-Art’ experience and on a good day, I am sometimes able to create that. One of the things that I love about New Eden is that it richly rewards these two tendencies. If you love the In-Danger-But-Unharmed experience and also the Fight-As-Art experience, and you are seeking out opportunities to create these experiences, you find yourself often thrown into fights that are not necessarily favorable. This makes you extraordinarily engageable, and it gets you a ton of fights, which helps you improve rapidly. ISD: You are best known in the capsuleer community for engaging gangs and fleets with just your dreadnought class ship and recording your fights. Dreadnoughts are amongst the largest ships with high damage output, strong tank and a price tag up to several Billion ISK. When did you start doing that and what brought you to try this? L.E. : I started trying about six months ago. I love everything that’s done on a grand scale and thus have always been very attracted to capital combat. After training into carriers and dreadnoughts, I saw Big Miker’s Drift Naglfar video and said “Well shucks, I have to try that.” As it turns out, I have not actually tried Drift Naglfars yet, but it’s on the to-do list. My first engagement ever in a HAW (high-angular weapon, i. e. anti-subcap) dread was a Revelation against about a dozen frigates, which in retrospect is absurd, but I had no idea at the time. My heart was pounding a mile a minute as I was just sure this small kitchen sink frigate gang would have supercarriers on standby. ISD: How many of these engagements did you have so far? How often do these engagements end with the loss of your ship? L.E. : I have had 32 HAW dread fights, some of which are little, three-minute-long skirmishes where I kill a couple of dudes and the rest disengage, and some of which are these huge, sprawling, 40-minute-long affairs were the dread sort of forms the nexus of a swirling chaotic melee. One of my craziest fights to date had two separate red gangs and a blue gang, and the reds dropped six carriers; I used all 800 of the stront I had with me. The fight finished almost in perfect timing with my last siege cycle. I have lost eight HAW dreads over the last six months (about half after good fights and the other half after some not-so-good fights). ISD: Have you done similar experiments with other shiptypes? L.E. : I have done a huge amount of flying in Faction Warfare space in T1 frigates, some FW cruiser work, some null cruiser work. The thing that is probably the most similar to the dreadnought work is the stuff I have done in marauders. I actually find marauders a touch disappointing, to be honest; they are kind of like small, fragile, expensive, low-damage dreads that have no jump drive or fleet hanger. That said, a gang of 15 mostly won’t engage a dread, while they might fight a marauder. I have some experiments with pirate battleships in the queue as well, and I am looking forward to trying them. ISD: Many players cannot afford a Dreadnought but would still like to do something similar to your videos. What would be a good alternative for smaller wallets? L.E. : I think you can do the fly-it-like-you-stole-it concept in almost any ship. I had an awesome time flying Magnates around FW space trying to pick fights with people. So much of having fun in this activity is just about trying to create interesting, enjoyable engagements that work for whatever you are flying. The engagement creation is itself a skill, and if you find that you are mostly getting engagements that you don’t like, you can work on that and become better at it. I would encourage everyone who is interested in solo combat to go out and give it a try; solo combat in New Eden is some of the most fun I have ever had as a capsuleer. ISD: What would your twist be on the standard advice "Buy 20 T1 Frigates and lose them in FW"? Which small steps can an ambitious capsuleer take to improve his learning experience? First, find a group that has similar interests; trying to learn on your own is much harder than trying to learn with a group. Even if you are flying solo, you can get wealth of knowledge from other capsuleers. Second, use a shipping service (or a friend) to move your 20 T1 frigates into position so you have less downtime between fights. Pick a fight, die in a fire, do it again. Third, record your fights and watch them over again when your heart is not pounding. You will see plenty of errors and you can use that feedback to improve. ISD: You probably know about other solo combat pilots in New Eden. How would you weigh individual talent, skill and experience in that activity? What is needed to have fun and some success in casual solo fights? Is there hope for capsuleers who don't bring strategic talent and just want to shoot things? L.E. : New Eden is a hard place, and solo combat is especially hard. I am not sure what role that talent plays, but I can tell you everyone that is good has put in a lot of work. If you just want to shoot things and don’t want to work to improve your game, you can absolutely do that, but you will have to ride along with a content creator who does want to do the work. If you want to create your own content, and you are interested in developing your game, you might have to do a lot to get there, but it will be very satisfying when you do! ISD: Thank you very much for this interview. L.E. : Thanks for taking the time to talk with me. On the 17th of December YC119, at roughly 13:50 a Revenant supercarrier belonging to Mister Meseeks Lookatme was destroyed in the Providence region when it unknowingly cynoed into a defensive trap. Providence is an area famed for the welcoming attitude residents have for new Capsuleers operating in their region. Provibloc residents allow unknown Capsuleers to come and go in their space freely, as long as they do not harm any of the residents. Despite this known policy, a small hunting party decided to take their chances on an attack of a mining fleet. A Sabre class interdictor piloted by Beautiful Thieves, found its way into the system of FC-3YI, a system that is known to contain a regular mining fleet. The interdictor pilot decided to spring a trap and thus she waited for the ideal moment. She soon found a freighter in the asteroid belt, supposedly picking up the jetcans from the mining ships, as well as a single Procurer. She moved in quickly and bubbled the Freighter and Procurer and then burned away to get some range before lighting her cynosural field to allow the Revenant to come in and destroy the ships. Unknown to both Mister Meseeks Lookatme and Beautiful Thieves, an interdictor belonging to Provibloc had been cloaked just off of the Procurer. As soon as Beautiful Thieves lit her cynosural field, the Provibloc interdictor decloaked and burned straight at the hostile interdictor and bubbled up. Thus, when the Revenant jumped in, it was right into a bubble. The Revenant immediately targeted the Provibloc interdictor and destroyed it, but during this, another Provibloc ship fitted with a cynosural field was exiting warp and a cynosural field was lit; in jumped 12 dreadnoughts, two heavy interdictors and a single Apostle. Straight away, the dreadnoughts begun targeting the Revenant and lashing out with their formidable firepower. At this point, realizing his mistake, the Revenant pilot called in a friendly Minokawa belonging to Eonan Dmalum. Lordmopp1, the fleet commander for the Provibloc response force ordered all neutralizers to be put on the Minokawa and all damage to remain on the Revenant. After just several minutes, the Revenant was downed and the Minokawa followed soon after. At roughly 12:35 on 12th of November, YC119, a Revenant super carrier was spotted warping to a safe spot from the Aunenen free port citadel. Soon after, the Revenant was scanned down and destroyed. The Revenant is a rare vessel as it is a supercarrier never designed or built by any of the four major factions in New Eden. Capsuleers who set their sights on obtaining one would have to pit themselves against the True Sansha incursions that specifically target lowsec space and hope to pick up a blueprint copy dropped from a destroyed mothership. Because of this, the Revenant had become an extremely attractive ship often costing as much as a titan, with one recently being sold for 85-90 billion ISK. With the true number of those in existence remaining unknown, we believe that a total of only fourteen have ever been destroyed. Noticing the Revenant’s movement from the station, Guillejejeje XDD used his Onyx to combat scan the Revenant as it was exiting warp. When he warped to the Revenant’s location he decloaked it and immediately tackled it. Attempts were made to ransom the Revenant as well as an offer of safe passage if the pilot ejected. In a defiant move, VANO DERR, the Revenant pilot initiated self destruct, showing he would not be ransomed. As soon as the cynosural field went up, several super carriers and carriers jumped to the beacon and applied their formidable damage to the stricken Revenant. The Revenant was using a travel fit and had not even been outfitted with heavy fighters.. there was no possibility of escape. The attackers suffered no losses while the Revenant loss was valued at around 101 billion ISK. In an impressive show of coordination and determination, an allied force of L A Z E R H A W K S [HAWKS] and Hole Control [HOLE] under the leadership of Hard Knocks Citizens [HKRAB] destroyed ships from inPanic [-INP-] valued at about 156 billion ISK while suffering only minimal losses of about 200 million ISK value. The bulk of the inPanic losses were the 12 Rorqual Capital Industrial class ships that were the target of the original ambush. New Eden Correspondents had the opportunity to talk to both involved Fleet Commanders (FC). It was on YC119.11.19 that a force of 64 Sleipnir class command ships and 26 Legion class strategic cruisers along with two dozen logistic and tackle ships prepared for a quick incursion into CHP-76 under the command of Hard Knocks Citizens' FC Braxus Deninard. Hard Knocks Citizens, L A Z E R H A W K S and Hole Control live exclusively in wormhole systems and use the ever-changing, chaotic connections through wormhole space to engage opponents whenever and wherever they can. inPanic lives in nullsec and claims sovereignty over 29 systems. When a wormhole to a system in inPanic space opened, Braxus Deninard realized he had the opportunity to continue the hunt in inPanic space that he had been conducting on and off over the past year. But rather than trickle into the space and look for targets, Braxus relied on his past experience from similar incursions and kept his ready fleet in wormhole space, hidden from the watchful eyes of local intel channels that would alert potential targets to a hostile presence. Braxus soon located a potential target of a dozen Rorqual class capital industrial ships focused on a mining operation in CHP-76, a system in Cobalt Edge which is governed by inPanic alliance. At 20:08 Evetime, Braxus kicked off his assault. About a dozen Sabre class interdiction destroyers entered K-space along with several interceptors and made best speed to the target area, completely swarming the surprised fleet of Rorquals that were quickly covered in Warp Disruption Bubbles and unable to flee. The main Hard Knocks fleet was very close behind them, but slower due to the warp speed of battlecruiser hulls. "From the initial tackle to bringing the fleet it was probably one minute. ", Braxus Deninard remembers. "The guy had very little time to respond and this was very intentional by me. ", he continues, referring to his opponent that day, the inPanic “Fleet Commander K.” [name withheld at request]. While the main fleet engaged the first Rorqual, Braxus was confident that their quick strike would secure them at least a few kills this day - and he also decided to wait for a response fleet for additional kill opportunities. “Fleet Commander K.” received the notification about the attack within moments. Although he was not in his pod at the time, he frantically started a call to arms for pilots and got into a pod himself. After about three to five minutes, he had assembled a fleet of 21 Sleipnir class command ships, seven Hurricane Fleet Issue class battlecruisers and seven Basilisk class logistics ships. The fleet gathered on a Titan configured to bridge directly into the system and only then received detailed intel about the enemy fleet. Facing an enemy with superior numbers on the same platform, “Fleet Commander K.” had to make a snap decision, believing that the composition of his reaction fleet was compromised; "Hard knocks does not suspect. They have spies." A visual recording of the fight seems to bolster the suspicion that Hard Knocks was well aware of inPanic's fleet composition before they even entered the battle. Despite their best efforts to rescue even one Rorqual, Hard Knocks quickly decimated the inPanic fleet and continued to fire on the Rorquals. During the battle, only one of the Interdictors that held down the Rorquals and one Interceptor could be killed - not enough to free even one of the Rorquals. The fight was decided very quickly and the imbalance only got worse when a Hard Knocks supercarrier moved onto the grid as well, launching relentless waves of fighter-bombers against the remaining Rorquals. After the fight, both FCs assessed the situation. Braxus Deninard admits: "Their formup was very fast", but quickly adds "which was a significant part of why they failed to save their Rorquals. I felt like if they had taken another 5-10 minutes to form up a much larger home defence fleet including a strong capital force, they would have had a much better chance of saving their Rorquals. Instead they came very quickly with a relatively small fleet which was never going to win." In addition, he admits that: "I was hoping for a much larger response fleet from inPanic, leading to a much larger fight." “Fleet Commander K.” felt that they would have had a better chance with improved positioning from the very start. He explains: "The struggle we had was, that Hard Knocks Citizens did headshot seven FCs from us in a row. When we still loaded grid, they were already targeting us. Warping in at range would have been better, even if it takes longer to get in position." Losing seven essential pilots out of about 30 in the first few seconds was a hard hit, but “K.” was calm and realistic and felt a lot of respect for the level of competence Hard Knocks Citizens regularly presents: "Our alliance might be relatively big compared to them, but there you can see that skill, dedication and intel can give you the upper hand even if you're outnumbered on paper." Though there was no specific target that day, preparation and careful planning for assaults such as this had paid off handsomely. We will see how the relationship between these two alliances develop in the future. This was surely not their last engagement. Possibly one of the largest battles ever seen in HighSec space occurred on 21st of August YC119. As part of their attack on several alliances in the north, Goonswarm Federation [CONDI] had formally declared war on Pandemic Horde [REKTD] through CONCORD, enabling them to fight Pandemic Horde anywhere in New Eden. After other alliances of the Imperium coalition had followed Goonswarm Federation’s lead, Pandemic Legion [-10.0], an alliance closely connected to Pandemic Horde, reacted as well and declared war on all of these alliances. While under wardec CONCORD allows capsuleers to shoot each other without interfering - the stage for a monumental clash in HighSec had been set. Since shortly after the introduction of Skill Injectors in February and Citadels in April of last year, freeport citadels on the overview shape a pilot’s impression of Perimeter while flying through the system. Just one jump away from New Eden’s main trade Hub - Jita 4-4 - Perimeter quickly established itself as a tradehub for special items. Even though the market taxes are small, having an established market there is still very lucrative. One market citadel of the Fortizar class, albeit not the most lucrative one in Perimeter, was the “PanFam secured Hub” owned by Pandemic Horde. Maybe in an attempt to disturb the income of Pandemic Horde or to show New Eden that the great PanFam coalition is not invulnerable, the Imperium targeted this citadel, easily wiping out shield and armor of the structure and preparing for a big fight around the structure timer on YC119.08.21. Once the day arrived, the strategies on both sides couldn’t have been more different. While Pandemic Horde, assisted by Norther Coalition. [NC], Mercenary Coalition [MC] and the Guardians of the Galaxy coalition brought their signature Machariel Battleships as well as several Tech 3 and Tech 2 hulls, the Imperium brought almost exclusively Tech 1 ships: an armor based fleet of Typhoon class Battleships with a T2 logistics wing and a second, shield based fleet made out of Hurricane class Battlecruisers. The battle began with both sides engaging each other and the Imperium attacking the Citadel simultaneously. "The DPS ships where ordered to put their drones on the citadel, the Typhoons would fight the enemy Machariels. ", Imperium logistics pilot Jorry Cassel remembers the fight. A Tech 1 Battleship fleet would be heavily outmatched against the same number of Pirate Battleships and this fight was no different. Pandemic Horde FC Steadyo confirms that "initially we brawled against goon typhoons, trading extremely well until they started losing DPS and they gave up the fight against us and turned all damage to the Fortizar." But the Imperium came prepared and had ships ready to give out to replace losses: "If we were to die, we needed to warp to one of two citadels where a member of the coalition would give us a replacement ship - one citadel for Typhoons and one for frigates. I assume the Hurricane fleet had the same setup. ", Goonswarm Federation's Jorry Cassel explains. Through this logistical masterplan, the fleets could stay in the fight for a long time. Although both sides initially held their own, when the citadel was at about 40% of its structure, the fight turned relatively one-sided, with the Imperium not being able to keep up the pressure on the Machariels. "We lost many Typhoons and had almost run out of replacements. ", Jorry Cassel stated. It was at this point that the attention of the fleet was split between absorbing damage from the enemy fleet and attacking the Citadel, with Imperium logistics teams trying to keep as many ships alive as possible. When the structure hit around 20% integrity, replacement ships had run out and everyone who lost a ship was ordered to fly to New Eden's main trade hub, just one jump away, and buy whatever ship they could afford. This perseverance paid off as the Imperium managed to constantly lower the structure's hull. But the battle had arrived at the decisive moment, as Jorry Cassel vividly recalls: "When we hit about 10%, all the Typhoons where nearly dead and we got the order to withdraw to a friendly Astrahus and reform with the Hurricane fleet, that was reformed in Hakonen. While reforming, the citadel's repair timer was being paused by people just warping in Newbie Frigate after Newbie Frigate." Pandemic Horde's Steadyos account is very similar: "They came in Destroyers and Frigates and spread out, hitting the minimum damage required to pause the repair timer and stopping the clock at 2 minutes and 46 seconds." 387 Tech 1 Frigates and even 37 Corvettes were used during the fight in this important effort to keep the citadel's repair systems from activating. A tactic of hundreds of little pinpricks instead of dozens of Battleships turned out to be a successful tactic and bought the Imperium some precious time. The reformed and merged fleet then entered grid again and took over the attack on the Citadel, disregarding the enemy Machariels decimating their ranks. In the end, the Imperium won the race against the clock; the Fortizar class Citadel had been destroyed. Perseverance had prevailed over finesse. "We had just proven that if you keep throwing ships at it, you can destroy every Fortizar in the game. ", says Jorry Cassel, while Steadyo points out the cost of this success: "It goes to show: if you hurl enough ships at a fort it will eventually break. In a showing that resulted in the very definition of a Pyrrhic Victory." Sure enough, the price for victory was great and the success not as long-lived as many had hoped. The Citadel had been replaced within 48 hours with a newly anchored, uncontested Citadel and the impact on the market hadn't been particularly noticeable. Still, the local traders were sent a message; your favourite market hub can come under attack and be destroyed at any time, but a station is the safest bet for your business. Alongside the Citadel, about 93 Billion ISK value was destroyed - 70 Billion ISK for the Imperium alone. 166 Battleships, 80 Battlecruisers, 387 Frigates and 37 Corvettes found their demise in this battle. As of this moment, it is not clear if the Imperium will attack another Pandemic Horde citadel. However, Steadyo makes a promise for Pandemic Horde: "If there is another attack, we have plans in place which will see them bleed just as hard, but this time without a Fortizar kill at the end." The Mittani, leader of The Imperium and alliance executor of Goonswarm Federation, was delivering his State of the Alliance, in which a northern deployment for the Imperium would be announced. While the address was underway, Pandemic Legion used the opportunity to turn its sights on a group of Rorquals in the system of N-8YET in Delve, the current home region of The Imperium. The Imperium supercarrier pilots as well as Pandemic Legion FC penifSMASH declined to comment on the matter, but what is clear is that PL managed a successful drop on the Mining fleet by bringing nine Dreadnought capital ships, 24 Battleships including nine Bhaalgorns, eight Interdictors and several other vessels. During the time until the publication of this article, more Rorqual industrial capital ships have been destroyed, giving the impression of a greater hunt. Surely, many predators will now have a closer look at the region of Delve and potential victims. A total of 245.5 Billion ISK in assets as been lost by the Imperium with only one ship lost for Pandemic Legion, valued 73 Million ISK. The Imperium is a large coalition comprised of multiple alliances led by Goonswarm Federation. The coalition currently resides in the Delve region of null security space. Since they moved into Delve, they have been mining constantly using the powerful Rorqual-class industrial capital to eat their way through asteroid belts all over the region. The Rorqual while it is an important asset for any mining fleet, can also be a hindrance. The Rorqual's industrial core when active, provides a very large boost to the mining ability of mining drones. The Industrial Core reroutes power from the engines towards the core itself boosting the defensive capabilities of the Rorqual as well as the mining and compression machinery. This means that while the industrial core is active, the Rorqual is effectively locked in place until the power has been rerouted back from the core to the engines. This process usually takes around five minutes to do, and leaves the Rorqual unable to flee a hostile situation. Despite this, many alliances opt to use the Rorqual in clusters and have capital ships on standby to jump to a cynosural field should one of the Rorquals get tackled. At roughly 18:50 a combined force of Shadow Cartel and WE FORM VOLTA along with several other alliances managed to tackle 5 Rorqual-class Industrial capital ships. Usually, when the Imperium have a hostile fleet in their region they would form a defense fleet and see the attackers off. This time however, they did not. Earlier in the week The Mittani, Goonswarm Federation leader and head of the Imperium coalition, announced that they would be going to 'burn the north'. As a result, there was no one left to defend the Rorqual mining fleet. There were a total of 11 Roquals when the combined hostile fleet arrived and all but 5 managed to escape. The Rorquals were quickly dealt with, only one of which had the time to activate the Pulse Activated Nexus Invulnerability Core module; "PANIC" for short. The PANIC module provides a shield around the industrial ships in the fleet and the Rorqual that used it. It strengthens the shields considerably but only lasts for six or seven minutes. Usually this would be enough time for most large alliances to scramble a defense fleet and rush to the aid. With no local assistance available, the last Rorqual was destroyed which left the hostile fleet to loot the field before making their swift escape. The total damage was a staggering 56 billion ISK destroyed while the attackers suffered no losses. A total of 5 Rorquals, a Rattlesnake-class battleship along with several other ships were destroyed. The battle report can be found Here. The Keepstar-class citadel is the most sought-after citadel in the whole of New Eden. Developed by Upwell Consortium they are extremely powerful but come with a very large price tag. A Keepstar will cost you around 200 billion ISK and are the only structure large enough to dock Super carriers and Titans. There were only four known citadels in the depths of wormhole space; two belonging to Hard Knocks Citizens [HKRAB], one belonging to Lazerhawks [LZHX] and one belonging to Inner Hell [-INHE]. On Thursday the 13th of July, YC119, the system of J135031, occupied by Inner Hell, saw the first ever wormhole Keepstar come under heavy attack. 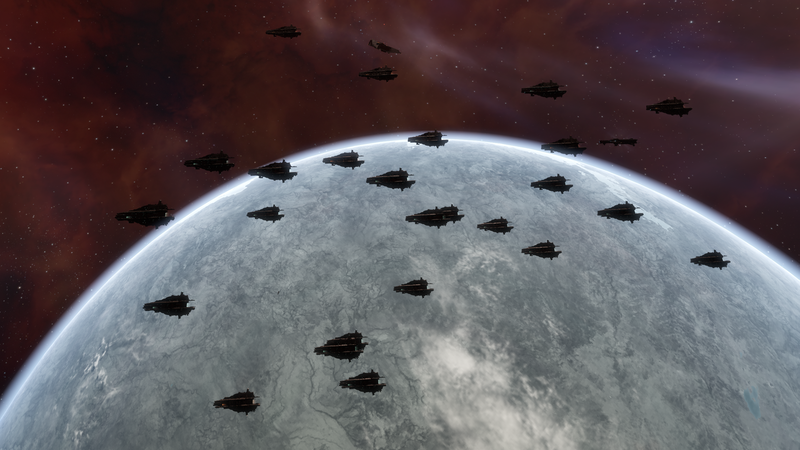 A combined force of Hard Knocks Citizens and Lazerhawks descended on the Citadel with a carrier fleet. With the capitals dealing the main damage a group of Machariel battleships hung nearby providing support. There were roughly 30 carriers, mostly comprised of the Thanatos class with a few Nidhoggurs and Chimeras as well. These larger ships would warp in at range to the Keepstar and launch their fighters, before heading back to their staging Fortizar nearby. This tactic allowed them to stay out of range of the deadly weaponry employed by the Keepstar. Additionally, If the citadel's defenders had shown up the carriers would have been in a position to easily disengage and tether on the Fortizar. The Keepstar was quickly stripped of its shields and went into a reinforced state. The next day, Friday 14th, YC119, saw the second phase of the assault on the enormous structure. This time the goal for the wormhole's invaders was to destroy the armour of the Citadel. Repeating their tactic of the day before, Hard Knocks and Lazerhawks warped at range with their carrier fleet and deployed fighters, warping back to their Fortizar for cover. As their combined force seethed around their staging point they set to work destroying the armour of the Keepstar. The massive citadel was again knocked back into reinforcement and the attackers now found themselves one step closer to their goal, having just one more day before they could destroy it completely. On Saturday 15th, YC119 the final timer for the Keepstar drew closer. Once again Hard Knocks and Lazerhawks set their carriers up in their routine manner. Several times Stealth bombers had decloaked and launched bombs at the fighters and Citadel in the hopes of being on the final killmail when it was received. Many of these bombers were eliminated with only a handful of Sabres lost as a result. Just before the Keepstar died Hard Knocks and Lazerhawks warped in dreadnoughts at 0 on the citadel, most likely to let their pilots get on the kill. A few Dreadnoughts had warped in early and as a result were destroyed. The Keepstar started to fire its Standup Arcing Vorton Projector but died before it was ready to fire. As a result, the dreadnought fleet survived. Noobman from Hard Knocks who helpfully agreed to be interviewed for this article said that, "The target was not chosen out of malice, it was chosen because the goal was to kill a Keepstar in wormhole space. I want to say I helped FC [Fleet command] this op but the two people that organised everything are Braxus Deniard and J3rz11. Months ago we told our members that they needed to train carrier pilots and able to use fighters. After that we started the process of buying up carriers and dreadnoughts and moved them to some of our C6 Wormholes that had a Static Class 6 wormhole. About 5-6 weeks ago we told our members to move into the static C6 holes and we would start seeding them into the target. We had some days we would get zero pilots into the target and some days we would get over 20 capitals in.In total we seeded 143 capitals. 60 Dreadnoughts, 74 Carriers, 4 Force auxiliaries, 4 Freighters and 1 Rorqual. We planned for multiple scenarios and brought in multiple fleets to reship and fight certain defence fleets." Noobman also informed New Eden Correspondents that there was over 120 billion ISK worth of loot that was not destroyed when the Keepstar exploded. "We used to call it 'Домашка' when we were referring to it. A rough translation is 'home'," says Confiscated when asked what they called J135031. He also mentions he only found out about the attack on their Keepstar thanks to Reddit. When asked if Inner Hell would survive through this tremendous blow his reply was positive - "Yes, we will continue to live and prosper even after this. We will continue getting our content from Null. We will also be putting a Keepstar in our new home". When asked if he had any other comments he replied "I'd like to acknowledge that HK [Hard Knocks Citizens] did a great job. I used to do evictions with our guys and it's a lot of work to keep hole control and to get capitals in." I would like to thank Noobman and Confiscated for taking the time to talk with New Eden Correspondents. A list of all the ships that survived the Citadel's explosion can be found here along with some of the stealth bomber kills. The killmail can be found here.